Microsoft Exchange ActiveSync (EAS) is a synchronization protocol that enables mobile device users to access email, calendar, contacts, and tasks from their organization's exchange server. But what is less commonly known is that IT admins can use their exchange server to manage Knox container apps and policies. You can set up EAS accounts in both the personal environment as well as the Knox container. The main reason why you should configure it inside the Knox container is to prevent data leakage. The file is not encrypted by default. The SD card can be stolen, or the file can be transferred to a PC through USB. The file is encrypted by default. The file is protected by SE for Android, and cannot be accessed by apps downloaded from Google Play into the personal space or distributed by malicious apps that do not have the proper authorization. The file cannot be saved to an SD card or transferred to a PC through USB. Typically, IT admins use a third-party EMM solution to manage devices and Knox containers, using a full complement of supported policies. EAS is another tool available to IT admins. One scenario is if EAS is already configured for a wider range of device platforms in an enterprise, IT admins can use EAS to push policies to all configured platforms. All other EAS policies cannot be managed in the Knox container. These include password recovery, password reset (the password must be reset through an EMM), Bluetooth/Wi-Fi access, Internet sharing/tethering, IrDA, text messaging access, and storage card access. 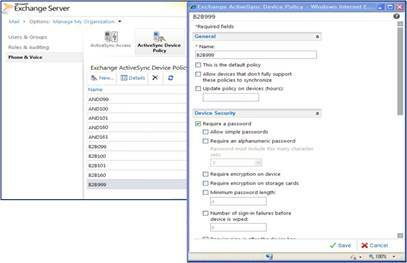 Exchange ActiveSync - see Microsoft Technet > Exchange ActiveSync. Knox containers and how the preloaded email, calendar, and contacts apps work - see the Knox User Guide (enterprise or personal edition) on the Knox web portal > Support page. How do I troubleshoot Exchange Active Sync configuration issues on Knox devices?